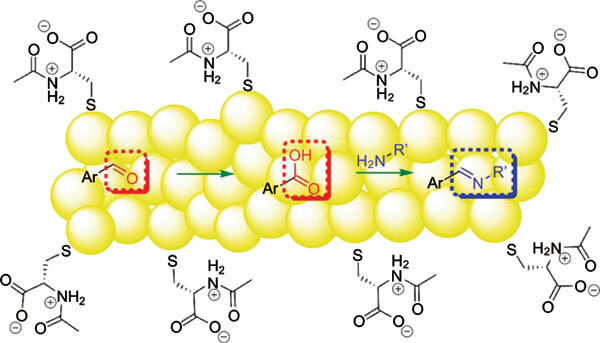 Background: In this work, we aimed to synthesize gold nanoparticles stabilized with Nacetyl- L-cysteine and study their catalytic activity towards the benzaldehyde oxidation as well as the formation of imines. Methods: N-acetyl-L-cysteine stabilized gold nanoparticles were prepared and the catalyst was characterized via spectroscopic techniques such as UV-VIS spectrophotometry and SERS. Gold nanoparticles dimensions were evaluated through DLS and SEM. After having the catalytic system set, the oxidation of benzaldehyde and the one-pot reaction for the synthesis of imines were proceeded. All the products were characterized via NMR spectroscopy. Results: Regarding the nanoparticles dimensions, a diameter of approximately 25 nm was achieved. Firstly, gold nanoparticles were effective towards the benzaldehyde oxidation, with a conversion of 97%. Furthermore, we investigated a one-pot formation of imines and it was noticed through NMR analysis a carboxylic acid as intermediate. Finally, a substrate scope with different aldehydes and amines was created and products were obtained with up 99%. Conclusion: N-acetyl-L-cysteine modified gold nanoparticles are effective support-free catalyst for the chemoselective aldehyde oxidation/amine coupling to imine under mild conditions. Aromatic aldehydes were consumed to form benzoic acids and went under an amine coupling reaction giving a wide range of imines. This consists the first example in which there is a support-free catalyst capable of synthesize imines from aldehydes through carboxylic acids with good to excellent yields. Gold nanoparticles, catalysis, imines, N-acetyl-L-cysteine, benzoic acid, benzaldehyde.